Saturday, May 5, is the day to get those sensitive documents shredded and disposed of. Navy Federal Credit Union holds a shredding event from 9 a.m. to 1 p.m. at its new office in Silverdale at 3340 NW Randall Way. One in 20 Americans, or 12 million people, became victims of identify fraud last year, according to a statement from the credit union. “(The event) allows our team members to introduce themselves, hand out practical information on identity theft, while citizens practice environmental responsibility,” said Patrick Miller, Navy Federal’s vice president of branch operations. People should not bring more than four boxes of personal documents. Business or commercial materials will not be accepted, along with compact discs and hard materials. The price of gas in Kitsap County appears to have stalled indefinitely just above the $4 mark. Auto club AAA reported Friday the average price of a gallon of unleaded gasoline stood at $4.04, almost unchanged from a month ago. A year ago, local motorists weren’t paying much less, when the price was $3.98. Statewide, the price stood at $4.08 Friday. Some encouragement comes this morning from the state Department of Revenue, which reported a rise in taxable retail sales statewide, the first time since 2007 when the economy tanked. Statewide, taxable retail sales increased 3 percent to nearly $104 billion in 2011 over 2010. That compares to a 0.1 percent drop in 2010 and a steep 11 percent drop in 2009. For Kitsap County, taxable retail sales went up in 2011, but not as sharply. Just more than $3 billion was reported, a modest 0.35 percent increase over the previous year. Bremerton topped local cities for the biggest rise — 4.5 percent for a total of $686 million. But other local cities lost ground last year. Port Orchard experienced a 3.7 percent decrease to $312 million. Poulsbo’s went down 1.4 percent to $324 million and Bainbridge Island’s slipped 0.43 percent, to $280 million. SEABECK — The public is invited to Seabeck Conference Center on Sunday, April 29, when it dedicates two new lodging buildings. “Huckleberry” and “Salal” each holds 16 people in eight rooms, and follow the theme of naming various buildings at the scenic, historic center after Northwest plants and trees. The celebration starts at 3:30 p.m. in the dining room in the main building with an annual update from the conference center’s leaders. The new buildings are dedicated at 4 p.m. and tours begin after that. The buildings are made to look old, but are modern on the inside and handicapped-accessible. They mark the first new construction at the nonprofit center for many decades and were funded by gifts, two of the biggest from the C. Keith Birkenfeld Memorial Trust and the Bill & Melinda Gates Foundation. The center covers 90 acres overlooking Hood Canal and has been in operation since 1915. Some of the shingled and clapboard buildings predate the Civil War. Each year, as many as 200 groups from all over the world come to the center, 93 percent of them repeat visitors. The center is Seabeck’s unofficial community hub. The new buildings are part of a subtle 20-year upgrade aimed at making the center a little less rustic so it can continue to compete for customers, while retaining its old-time character. 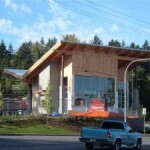 More information about the center is at www.seabeck.org, along with renderings of the new buildings. Kitsap energy consumers and their neighbor counties just north and south of Seattle pay much less for electricity than elsewhere in the nation, but much more for natural gas. The U.S. Bureau of Labor Statistics reported Wednesday that Kitsap and neighbors paid 30 percent less for electricity, but 28 percent more for natural gas for the month of March. A kilowatt-hour of electricity locally cost .089 cents, while elsewhere in the nation, it went for .127 cents. For the past five years, local electricity prices have been consistently below national average, according to the BLM. As for natural gas selling for much more locally, a therm averaged $1.253 in Kitsap and envions, compared to $0.978 nationally. 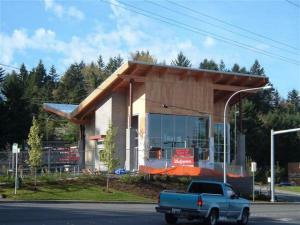 Mud Bay blogger Rod Wilkinson informed me he’s starting a name-that-Starbuck’s contest for the Starbuck’s going up on Kitsap Way in Bremerton. I was perusing his entertaining blog, at www.mudbay.wordpress.com, and see it’s already got one name, V-Bucks. Ha, ha. “I’m not looking to promote Starbucks or the blog but rather to see if other people find the new building as unusual looking as I do,” he stated. So go ahead and name it on Rod’s blog, and cc me here, too. I, for one, think the roof echos what Walgreen’s has going on with its entrance. It seems a little jammed onto the property, though. Mud Bay, by the way, is that aptly named shallow stretch that separates Rocky Point from Marine Drive. It turned into a bidding war for the pin, and the price went “considerably” above the $1,500 Wall was asking for, but remained in the four digits, he told me. Always a fascinating story when I get together with Mike. KPS Health plans has agreed to refund thousands of dollars to customers who were overcharged recently. Approximately 235 individual and family customers were affected and KPS is fixing the problem now. The problem concerned a computer error tied to the Bremerton insurance company’s exit from the individual and family market. Affected persons, call me at 360-475-3783. See my story soon at www.kitsapsun.com. The per-gallon cost of gas decreased 2 cents last week down to Monday’s $4.11 for unleaded, says auto club AAA. That’s a cent less than the state average of $4.12 and well above that national average of $3.90. The highest prices can be found in Hawaii, where islanders are paying $4.60 a gallon. Wyoming has the lowest, with $3.62. This time last year in Kitsap, we were paying $3.94. Come 3 p.m. this Sunday, the doors at the Port Orchard Family Pancake House slam shut and some 20 demo folks immediately will start tearing the place apart in a matter of hours. In a week and about $200,000 later, the doors will reopen, with new dry wall, tile, carpet, seating, window dressing, lighting — the entire shebang. It’s a uniquely choreographed fast dance, with different work crews stepping in and out right on cue, faster than anything you’d see in residential construction. “And then in a few days, everything’s back in, brand new,” said Jeff BeCraft, vice president of operations for the chain of five restaurants. The restaurant, which opened in 1989, is a local favorite and historically the biggest money-maker of all five Family Pancake Houses, though the one now in Redmond has overtaken it. It’s been six years since the last interior remodel on the Port Orchard eatery. Owners have to work as fast as they can to get the work done, because being closed costs money and they don’t want customers in that week to get used to going somewhere else. “You don’t want them to get very comfortable at the new place,” said DeCraft, who had some advice for businesses contemplating upgrades. Save up the money first. “You never want to overtake profits from your business,” he said. “You plan for this; you save for this,” said the longtime Family Pancake House exec. And once you spend what you save, start immediately to replenish the pot, he added. As for decor, think lighter, and blue, with all the brass gone. They’re saying the restaurant will reopen at 5 p.m. April 22, but it’s a good bet it’ll be a little sooner. If I receive any photos of the workers in action, I’ll post them here.